Geographically, the Antillean islands are generally considered a subregion of North America. Culturally speaking, Cuba, the Dominican Republic, and Puerto Rico – and sometimes the whole of the Antilles – are included in Latin America, although some sources avoid this socio-economic oversimplification by using the phrase “Latin America and the Caribbean” instead (see Latin America, “In Contemporary Usage”). In terms of geology, the Greater Antilles are made up of continental rock, as distinct from the Lesser Antilles, which are mostly young volcanic or coral islands. After the 1492 arrival of Christopher Columbus‘s expedition in what was later called the West Indies, the European powers realized that the dispersed lands constituted an extensive archipelago inhabiting the Caribbean Sea and the Gulf of Mexico. The Antilles were called multiple names before their current name became the norm. Early Spanish visitors called them the Windward Islands. They were also called the Forward Islands by 18th-century British. Thereafter, the term Antilles was commonly assigned to the formation, and “Sea of the Antilles” became a common alternative name for the Caribbean Sea in various European languages. 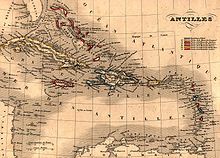 The Antilles were described in 1778 by Thomas Kitchin as once being called the Caribbee Isles in homage to the Carib people who were the islands’ first inhabitants. ^ “85.04.04: The Geophysics and Cultural Aspects of the Greater Antilles”. teachersinstitute.yale.edu. ^ One or more of the preceding sentences incorporates text from a publication now in the public domain: Chisholm, Hugh, ed. (1911). “Antilles” . Encyclopædia Britannica. 2 (11th ed.). Cambridge University Press. p. 126. ^ Society, National Geographic (15 September 2014). “Columbus Makes Landfall in the Caribbean”. nationalgeographic.org.